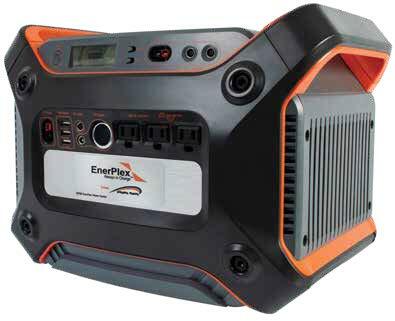 The EnerPlex 1200 Power Center is a lightweight and portable 1200Wh power center powered by a large format, 83 amp lithium battery and powerful 1000W AC inverter – no gas required. This power center is ideal for emergencies, camping, job site and whenever power is not available. Its small size, 16″ x 12″, and weight, 43 lbs., makes it easy to store or take anywhere. Description: The EnerPlex 1200 Power Center is a lightweight and portable 1200Wh power center powered by a large format, 83 amp lithium battery and powerful 1000W AC inverter – no gas required. 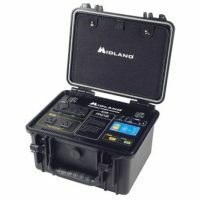 This power center is ideal for emergencies, camping, job site and whenever power is not available. Its small size, 16″ x 12″, and weight, 43 lbs., makes it easy to store or take anywhere. Recharge 3 ways using the included AC wall charger and 12V DC vehicle charger or using an accessory solar panel. Operates multiple devices using 120V AC, 12V DC, 5V USB, and 19V laptop outputs. Benefits: Eliminate the noise of a gas generator and use safely indoors without carbon monoxide poisoning. It’s an economical option with no gas to refill, or source in an emergency. Uses free solar energy! The compact and lightweight design makes the EnerPlex more maneuverable than a 12V lead acid battery. Power is easy to replace and easy to use with multiple options. Applications: Use where power is not available such as off-grid locations, remote jobsites, power outages, disaster relief, and recreational activities. Powerful enough to operate standard home refrigerators, lighting, small cooking appliances, and recharge radios, cell phones, and cordless power tool battery packs. May be used with AC power tools up to 1000W (9A) rating. The EnerPlex is rated in watt-hours (Wh). For example, if you connected a television drawing 100 watts of power you could operate it continually for 10 hours if the battery were completely full (1000Wh EnerPlex / 100W device = 10 hours). To find your device’s power draw, identify the Amps, Volts or Watts it uses. If watts are unknown, calculate it by amps x volts – watts. Examples only and based on the wattage draw of connected devices and a fully charged EnerPlex battery. Do not operate AC devices rated over 9A. Actual operating times and number of recharges will vary during operation and include normal power conversion losses of the EnerPlex battery. Charging the battery while using power will extend the operating times listed. 600W Microwave Oven (120V AC). Do not exceed 1000W. overload protection circuit will activate. May cause damage to the unit.